A Mainstreet Research poll found that 54% of adult Canadians cannot name a single Canadian visual artist, living or dead. In contrast, the poll also found that 97% of adult Canadians can name at least three Canadian hockey players. Are we really so divorced from art a majority of us can't name Emily Carr, Tom Thomson, Jean-Paul Riopelle or Norval Morrisseau? Before you read the next sentence, name three Canadian painters. If it took you a while to get here, you're in good company. A Mainstreet Research poll found that 54% of adult Canadians cannot name a single Canadian visual artist, living or dead. In contrast, the poll also found that 97% of adult Canadians can name at least three Canadian hockey players. It's hardly surprising the names of our painters don't roll off our tongues like our iconic hockey heroes -- but not being able to name even one? Are we really so divorced from art a majority of us can't name Emily Carr, Tom Thomson, Jean-Paul Riopelle or Norval Morrisseau? According to the poll, first reported on by The National Post, this is sadly the case. It's hard to overstate what the Group of Seven did for our national identity. Canada's first art movement, the Group of Seven pushed back at the European art world -- "Our landscapes are worth painting, and we can paint them however the hell we want," they seemed to be saying. Their paintings celebrated our sense of place. "The Indian Group of Seven" was another formidable influence on our collective consciousness. Daphne Odjig, Norval Morrisseau and Carl Ray helped their people reconnect with their culture and inspired generations of artists after them. Indigenous art has helped Canada's most disenfranchised peoples tell their stories with dignity and power. Our art has also helped us see things we don't want to see, but desperately need to. Edward Burtynsky's stunning, eerie, large-format photographs of industrial landscapes like Alberta's tar sands shocked the chattering classes. His work awakens, startles, even frightens -- a crucial step if we are ever going to take meaningful action against global warming. Hockey, we are reminded regularly, defines us as a nation, binds us in passion for a game we claim to own. Canadian art is just as important to our national self. It enriches us emotionally and intellectually -- studies show the more children are exposed to art, the better their outcomes. Art helps us see things differently. Funding art should be a critical piece in our approach to creating a better society, but it's easy to keep sidelining it, budget-cutting it and waiting for a year of abundance to prioritize it again. It's seen as a luxury product -- in times of economic hardship, a needless frill. That may be changing. Canadian Heritage Minister Mélanie Joly has pledged to double the funding for the Canada Council for the Arts to $360 million per year, calling it "a new relationship between Canada and the art scene and the world." Her phrasing is more than a ministerial talking point. It shows an understanding that Canadian art binds us. So why are so many of us disconnected from it? Young adults fared the worst in the poll. Is it because so many of them dropped art in grade 9? Or is it the way we consume art that turns them off? Perhaps the traditional way of viewing art in galleries is the root of the problem. The growing success of interactive art events such as Nuit Blanche suggests that may be so. 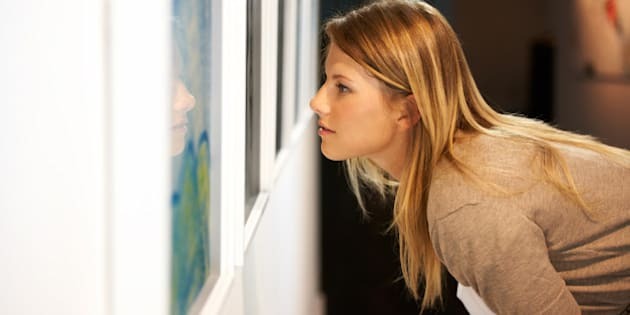 Perhaps most of us think we aren't smart (or rich or stuffy) enough to understand art. What do galleries need to do differently to allow the raw experience of art to be enough? Maybe we need to democratize art. Maybe galleries should be free. I have nothing against hockey. There's nothing I enjoy more than playing shinny with beer chilling in the snow. But the fact I can rattle off the roster of the 1976 New York Rangers more easily than I can name the Group of Seven strikes me as alarming. It concerns one of my shinny mates as well, Peter Doig, one of the world's greatest living painters -- and not a bad hockey player either. He suggests, "Artists themselves are partly to blame for the fact that their work is not known by the wider populous," Doig says. "Artists and their art have to make their presence felt, that it matters. We should then in turn be helped, through our education system, to learn why. In the same way that not every hockey player will have the presence of a Connor McDavid, we have to learn why some artists are more like a Marc-Édouard Vlasic--but equally important." It's an interesting juxtaposition: the value we place on a game versus the value we place on art. This poll confirms something I have long feared -- Canadian art is becoming less and less important to the average Canadian. We are a society obsessed with big league sports. But when we neglect Canadian artists and their work, we risk losing our capability to challenge the norms and pieties of our society, to tell our stories, to make our voices heard, and to fight injustice. Worse, we risk losing our humanity -- in the usual way one's humanity is lost: insidiously, incrementally and without even really noticing it's gone. We need more Canadian art -- and we need more Canadians to experience it. Grant Gordon (@_GrantGordon) is the founder of Key Gordon Communications, an advertising and design firm based in Toronto, serving a variety of clients in the arts and culture sector.